For truck marshaling details, contact your show. Continue straight on Calliope St. Riverbound. You’ll see our facility directly in front of you. Follow the signs to enter the Convention Center parking lots. Take I-10 East towards Slidell/Downtown New Orleans. Merge Right, continuing on I-10. (Do not take I-610 towards Slidell). Stay in the left two lanes and merge onto Exit 234A on the left toward Westbank/Highway 90 (Do not remain on I-10 towards Slidell). Exit right at the Tchoupitoulas/South Peters Street exit. This is the last exit before crossing the Crescent City Connection bridge. Take I-10 West to Exit 234C (West Bank/Highway 90). Continue on Highway 90 (the Riverfront Expressway) and exit right at Tchoupitoulas/South Peters Street. This is the last exit before crossing the Crescent City Connection Bridge. On ground level, merge into the right-most lane and travel down Tchoupitoulas Street. The check-in lot is the fenced in lot on the right. Enter gate and check in with the marshaling yard supervisor for weigh-in, truck ID number, and parking location. Do not go directly to the Convention Center loading docks without checking in with the marshaling yard supervisor. Take I-10 East to the West Bank/Highway 90 exit (do not continue on I-10 to Slidell). Stay in the right lane and exit right at Tchoupitoulas/South Peters Street. This is the last exit before crossing the Crescent City Connection Bridge. Enter gate and check in with the marshaling yard supervisor for weigh-in, truck ID number, and parking location. Do not go directly to the Convention Center loading docks without checking in with the marshaling yard supervisor! Exit the Truck Check-In Lot on Tchoupitoulas and merge into the left-most lane. On Tchoupitoulas, turn left onto Henderson Street. On Henderson Street, drive toward the river until you reach the Floodwall. Turn left at the Convention Center service drive just before crossing the floodwall. Do not go through the opening in the floodwall! 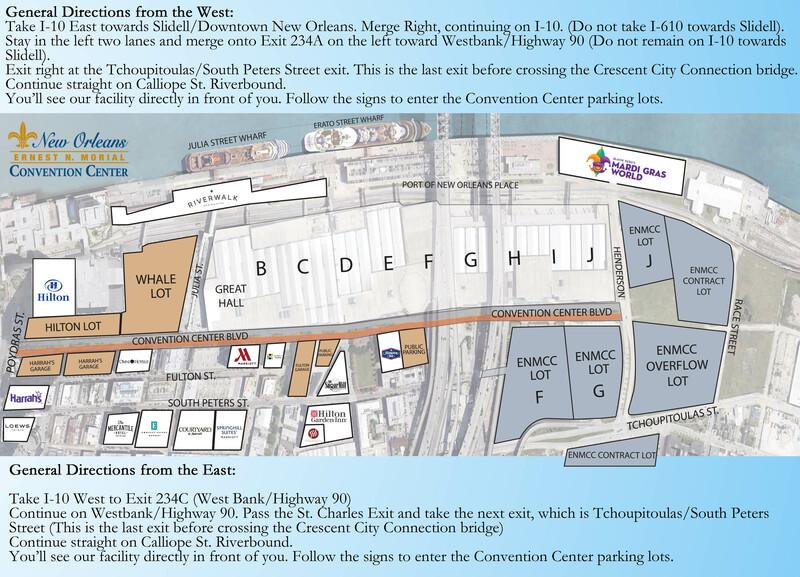 Continue on the Convention Center service drive, next to the floodwall, until you reach the Convention Center loading docks. Back into your assigned truck bay.